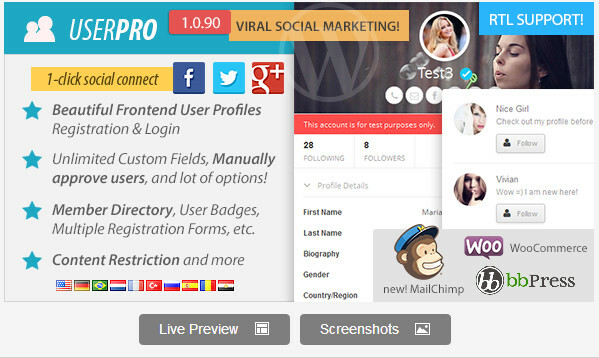 Several social networking, business WordPress sites are established with facilities such as memberships. Visitors that would like to acquire membership are enabled from the use of WordPress login plugins and widgets. There are several login plugins that uniquely have their own efficient functions. Below are the best free WordPress login plugins that will facilitate a convenient and easy access for membership. This is a WordPress Login plugin which is simply created to enable visitors to login to WordPress sites that offers memberships through scanning the QR Code together with their mobile device. Such a process significantly improves the WordPress site’s security and at the same time affixing innovative exciting factor during registration and login. Scan-to-login provides a fun experience during registration and logging including easy access. WordPress site ensures a great security through the conductance of processing 2-Factor authentication by combining mobile phones of users that wants to get a membership and the authorization of the WordPress site and login /registration functionality. Passwords are specially characterized for greater security. WordPress Modal Plugin is one of the best login plugins since it is highly organized characterized with a versatile login form. This plugin provides the simplest possible way of logging in through the use of easy-to-use forms displayed in the modal windows. To add this login plugin into the theme’s custom area, WordPress Modal Plugin is simply managed through the use of shortcode generator, custom widget or through the use of PHP. Log With Ajax is specially programmes for websites such as social networking sites and business sites that requires user registrations and login and does not want a typical page of WordPress login. This login plugin is capable of inserting login widgets in sidebars enhanced by the smooth login effect of AJAX. Login, registration, and reset password widgets do not require reloading of the web page since it is AJAX-powered. Users are redirected to the custom URL’s. Different users are redirected to URL’s (custom). Has WPML to promote multilingual property of a website. SSL compatible that provides a site with great security from prospective hackers. Template tags and Shortcodes are available. The specific option of widgets to show the links of profile pages. This plugin is customizable and allows safe upgrades of widgets. Nice Login Widget allows webmasters to several register and login widget in any pages in the WordPress site and lets them to easily manage it. 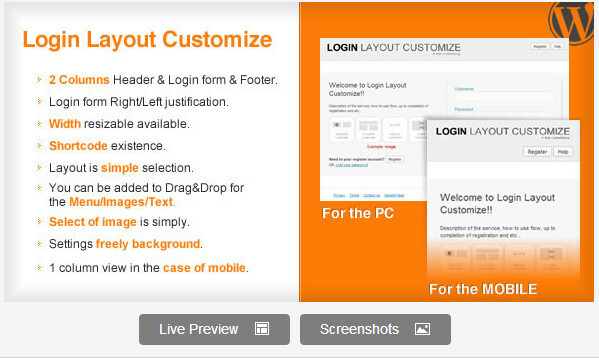 This login plugin make use of only one area to register, login and reset passwords that are forgotten. Login widgets can be displayed vertically or horizontally. This login plugin is SSL compatible in which it significantly provides great security in the WordPress website.